Friendly pub with good beer. Pub two on our Camra pub trail of Stockbridge and we never got any further. This tells its own story. The reason for staying put could only be partly down to tiredness from an afternoon sightseeing and shopping. The main reason was as well as an xmas party going on, there was also a very good band called the Decades. Sat, played name that tune and kept on fighting my way to the bar for another pint of Santa's little helper. By the end of the night, I was asking for Satans little helper. If a pub down a side street in a suberb of a City is this good, you really are spoilt for choice in Edinburgh. You want to see what passes for entertainment in my locals in Worcestershire. The last time anything resembling a folk band was on was when an old lady in a army jumper danced in the fireplace to the the jukebox. Good bar in the Late 80's, not now though. 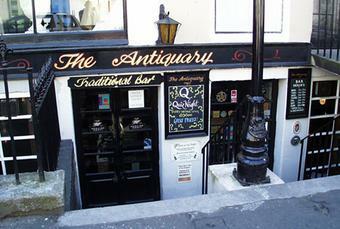 Lovely, panelled, multi roomed cellar bar of character. Quality pint. I like this pub. Guinness and Deuchars IPA has always been well kept and served well. Sunday morning brunch isreally good. One of the best value mealsin Edinburgh!